English rabbi; born at Bremen Nov. 30, 1852; educated at Jews' and University colleges, London. He officiated at several synagogues in England, and on the death of the late chief rabbi succeeded Dr. Hermann Adler as rabbi at Bayswater Synagogue, London. In Jan., 1900, he obtained the degree of Lit. 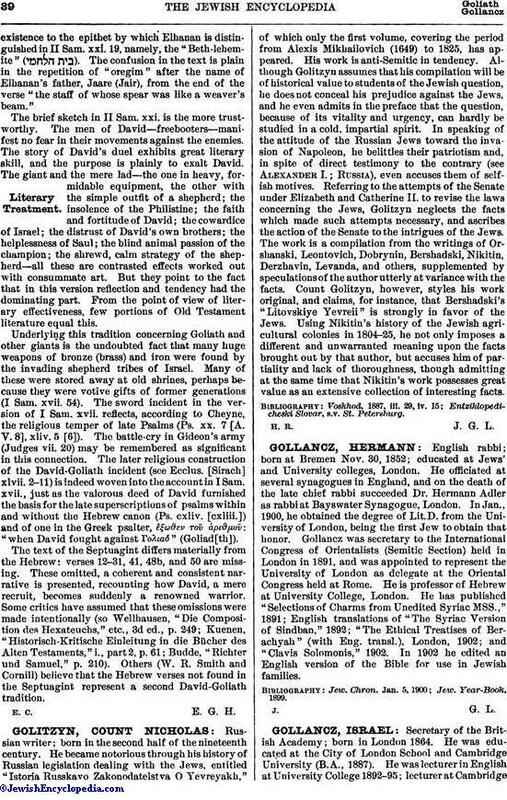 D. from the University of London, being the first Jew to obtain that honor. Gollancz was secretary to the International Congress of Orientalists (Semitic Section) held in London in 1891, and was appointed to represent the University of London as delegate at the Oriental Congress held at Rome. He is professor of Hebrew at University College, London. He has published "Selections of Charms from Unedited Syriac MSS.," 1891; English translations of "The Syriac Version of Sindban," 1892; "The Ethical Treatises of Berachyah" (with Eng. transl. ), London, 1902; and "Clavis Solomonis," 1902. In 1902 he edited an English version of the Bible for use in Jewish families.